Porous NiCu alloy with oriented pore structure was successfully prepared by freeze casting method with Ni powders and Cu powders as the source materials, and water as the solvent. 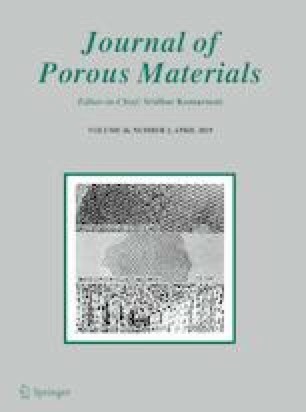 The pore structure of porous NiCu alloy was analyzed, finding that the porous NiCu alloy frozen at lower temperature having thinner wall thickness and narrower pore width. The electrocatalytic performance for hydrogen evolution reaction (HER) in 6 M KOH at room temperature was evaluated by cyclic voltammetry, linear sweep voltammetry and electrochemical impedance spectroscopy techniques. Results show that porous NiCu alloy frozen at − 50 °C exhibits the most excellent electrocatalytic activity for HER. The online version of this article ( https://doi.org/10.1007/s10934-019-00751-9) contains supplementary material, which is available to authorized users. This research was supported by the National Nature Science Foundation of China (Grant Nos. 51604305, 51674304, 51874368) and the Natural Science Foundation of Hunan Province, China (Grant No. 2018JJ3677).